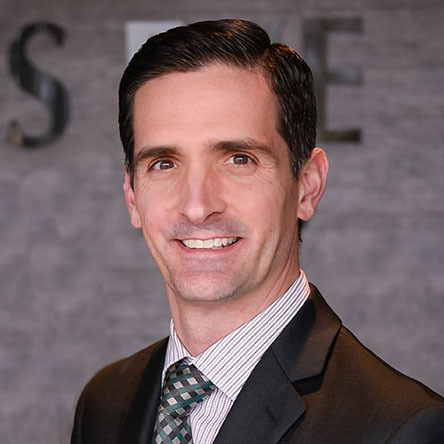 Dr. Marc Landes is an optometrist, past professional trumpet player, husband, father, and co-founder of Landes Eye Associates. He grew up on a farm in Elkhart, Indiana and went on to complete a Masters in Jazz Performance at Western Michigan University. After completing one year of course work towards a Doctoral of Musical Arts in Jazz Performance, he moved to Chicago to become a freelance trumpet player, where he had the opportunity to perform with Aretha Franklin, The Temptations, and various Broadway musicals, just to name a few. He met Dr. Allison Landes while she was still in medical school, and after marrying, went back to school and graduated from the Illinois College of Optometry in 2013. Drs. Landes have always dreamed of having the opportunity to work together in their own practice. Dr. Marc Landes provides routine eye care for adults and children including vision exams and contact lens fittings as well as the diagnosis and management of other non-routine ocular conditions. He can help determine whether you may be a candidate for cataract surgery or if you have a condition requiring more extensive evaluation and treatment. His patients appreciate his thorough examination, gentle bedside manner, and clear and honest explanation of their condition. Dr. Landes is a member of the American Optometric Association and the Ohio Optometric Association. He still plays trumpet in church on occasion and for their son, Luke, who loves tractors and music just like his Dad. "Everyone I met at Landes Eye Associates is so kind and pleasant."